Not all sauerkraut is created equal. Unless yours is home-made or ‘fresh’, the bottled varieties from the supermarket probably don’t have a squeak of any valuable ferment bacteria left in them as they have been pasteurised. Home-made sauerkraut, made the same way for many hundreds of years, is a lactic fermented cabbage. Lactic fermentation (using wild yeasts and bacteria) of vegetables is to a vegetable, what sourdough culture is to bread and yeast is to beer. The naturally occurring microbes in a lactic ferment turn carbohydrates to acids, preserving the vegetable while increasing our beneficial gut flora. 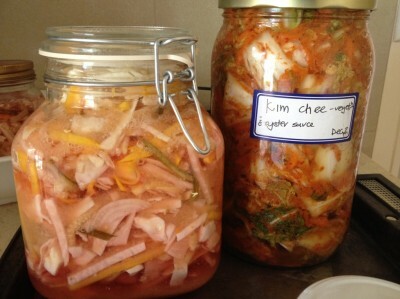 For those who have suffered from infections, or who have taken antibiotics or anti fungal medications, a regular serve of fermented foods may be just what you need to recolonise the gut flora. I recently enjoyed a series of podcasts from the ABC Radio National Health Report and All in The Mind, reporting research that shows we have about 1.5 kg (trillions of bacteria) of healthy bacteria in our bodies, mostly in our gut. A single dose of antibiotics can wipe these out and create a permanent impact on our health. Peter Turnbaugh from the University of California San Francisco described a study which indicated people on a high saturated fat diet (a high animal product diet in particular) compared with those on a vegan diet, had more microbes that contributed to inflammatory bowel disease and many other diseases including arthritis, and some cancers. The changes were seen in just 1 day of eating meat! Now I’m not saying don’t eat meat at all, but the researchers are indicating that eating more vegies = better health for our bodies, combined with lots of fibre and low sugar intake. 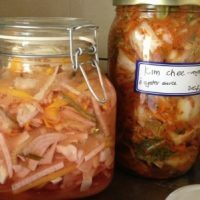 Consuming a range of fermented foods (probiotics) is considered to be beneficial to our gut health and immune systems by the researchers too. As we have thousands of different gut flora, a wide range of foods is better than say yoghurt alone. In the US, Psychiatrist James Greenblatt is treating those with disabling psychological conditions, with high dose, specific probiotics, and with interesting results. Here’s a recipe for our red and green sauerkraut to get you started. And by the way, do enjoy the transcripts/podcasts. They are fascinating. 3 tablespoons non-iodised salt. I use Himalayan pink salt for a few extra minerals. Clean a couple of large jars in hot soapy water and leave to drain. For this amount of cabbage you will need about 3 litres worth of storage jars. Wash the cabbages, remove the tougher outer cabbage leaves and retain. Slice the cabbages finely and put into a large bowl with seeds and peppercorns. Massage the whole lot until the cabbage wilts and releases some moisture. Pack into the jars with the juice, and press down firmly with a wooden spoon leaving 2cm air space at the top. Put the lid of the jars on loosely allowing gas to escape and leave on the bench for 2 days until bubbles start to form. Now seal the jars firmly and put into the fridge. Fermentation will continue slowly. Taste every few weeks until the sauerkraut is to your taste.